Globally, most of the 4.3 billion people of reproductive age in the world will lack access to adequate sexual and reproductive health services at some time in their life.1 Despite progress towards universal health coverage, the unmet need for sexual and reproductive health interventions is substantial and requires urgent attention and innovative solutions. For decades, self care products, such as the contraceptive pill, condoms, and sanitary products, have had a considerable effect on health and society.2 Technological developments have made self care products increasingly accessible, with a growing range of self administered medicines, diagnostic tests, devices, and apps. Vulnerable and marginalised populations could gain access to sexual and reproductive health services that they would otherwise not be able to access through health providers because of stigma, discrimination, distance, or cost. However, self care could introduce or worsen vulnerabilities if it allows governments to avoid their responsibility to provide good quality healthcare. Moreover, shifting control to individuals may unintentionally shift the financial burden to the users and increase out-of-pocket expenditure. This article aims to identify the main economic considerations of self care for sexual and reproductive health and rights in the context of universal health coverage. We consider how the use of self care interventions could affect how much societies pay to deliver interventions and produce health outcomes, and how self care interventions affect who accesses and pays for these interventions. Self care interventions could enable health systems to get “more health for the money,” through technical and productive efficiency gains.6 Technical efficiency would improve if self care interventions were implemented at lower costs than care provided by the healthcare system and produced the same level and quality of health outcomes. Healthcare provision would be shifted to users, patients, or their care givers and fewer health system resources would be required. Such interventions would clearly be worth prioritising over provider based alternatives. Evidence on the cost effectiveness of self care interventions for sexual and reproductive health highlights the importance of the perspective taken.832 Focusing on health system costs and excluding user costs could lead to misleading conclusions on whether self care provides value for money for society. For example, self injection of hormonal contraception in Uganda saved costs for society because of savings in women’s time and travel costs.32 However, from a healthcare perspective, it was more costly than facility based provision of contraception (although still probably cost effective). Reviews of self management interventions for chronic diseases suggest that these interventions generally cost more, lead to better outcomes, and are cost effective (see appendix on bmj.com). Although these interventions improved efficiency by shifting tasks to patients, their effectiveness often depended on complementary support from the health system. Studies on the efficiency of self care for sexual and reproductive health have only been done on a few interventions in a few settings. The findings vary depending on epidemiological factors and assumptions on linkage to care. Studies funded by the pharmaceutical industry estimate large cost savings from self medication,33 but they may underestimate the costs of unintended consequences, improper use, and inadequate health provider support. External assistance has had an important role in financing self care interventions for sexual and reproductive health in low and middle income countries.38 Donor funds, however, are decreasing, requiring a greater reliance on domestic funds and a greater prioritisation of health in government budgets. This makes it all the more important to identify mixed domestic financing approaches for self care interventions to ensure that all needs are met. However, some self care interventions may make inequities worse if they increase access only for people who are socioeconomically better off. Health can be seen as a capital stock that individuals and societies can invest in throughout life.36 Similarly, the life course approach of the World Health Organization seeks to improve the functional ability of people and recognises that intervening at an earlier stage in life can show benefits at later stages.40 This approach is relevant when considering the demand for self care—who is most likely to use self care interventions, whether subsidised or not, and how this use is influenced by immediate and future benefits to the individual. Men’s use of m-health self care interventions reflects their greater access to and ability to pay for mobile technologies, and higher mobile phone literacy.2528 Reviews of self care e-health interventions for chronic diseases highlight that their use was restricted to people and community organisations with the means to pay for the electronic equipment; disadvantaged communities and elderly people were less likely to use these interventions (see appendix on bmj.com). Reducing these inequities of access by adapting the interventions may erode efficiency gains. Since financial and non-financial barriers to access are often connected, people designing self care interventions for sexual and reproductive health should consider behavioural economics. By using financial incentives, use could be increased and barriers overcome. Financial incentives have been used to create demand for and improve the supply of good quality healthcare. For example, for prevention of HIV infection, cash payments were given for negative test results for sexually transmitted infections, and they were effective in reducing the incidence of HIV infection when the financial incentives were large enough.29 Similarly, interventions that offer incentives to providers to promote self management (for asthma and diabetes) can improve quality of care (see appendix on bmj.com). Self care interventions can increase individual choice and autonomy over sexual and reproductive health. Availability of self care interventions together with healthcare services may help make the health system more efficient and more targeted. Information on their costs, cost effectiveness, and financing, however, is limited. Most studies are from high income settings and lessons were drawn from non-communicable diseases. Some interventions rely on the internet or postal delivery, which is not feasible in settings with limited resources. More research is needed on how self care interventions that reduce costs and improve sexual and reproductive health outcomes and rights can be effectively delivered in these settings, whether they have harmful unintended consequences, and how they can be equitably financed. Although self care often means self financed, data suggest that self care could reduce indirect user or patient costs and the risk of financial hardship for a household. For self care interventions to be sustainably financed, a combination of government subsidies, private financing, insurance coverage, and partial out-of-pocket payments will need to be considered, based on need and ability to pay. In the long run, the health system is still accountable for the outcomes from the use of self care and it should closely monitor the economic consequences of self care for households and governments. Self care interventions could also contain health system costs if they maintain diagnostic accuracy, use, and quality of care. Importantly, in some cases, self care interventions have improved access and linkage to care and health outcomes. For most self care interventions to be safe and improve access, health systems will need to provide different levels of support. Otherwise, they may simply promote fragmented consumerist healthcare and undermine person centred healthcare. 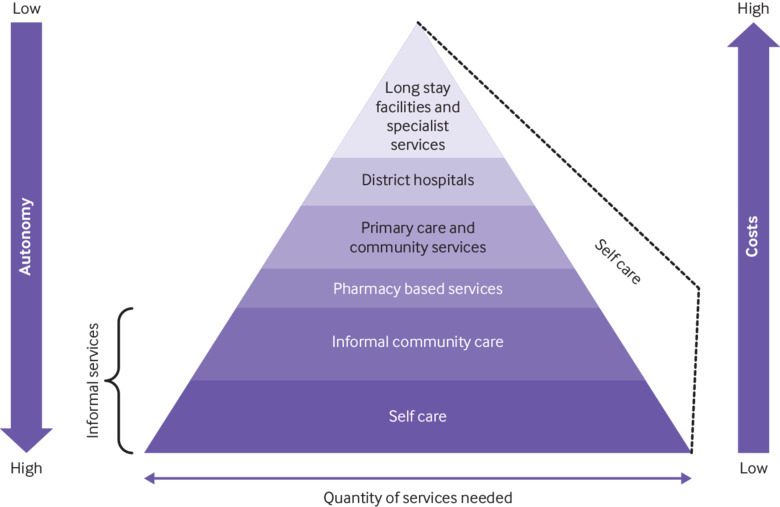 While efficiency is an important objective of any health system, equity must be integral to the economic assessment of self care in terms of costs, benefits, and financing. Globally, the social geography of illness is increasingly the social geography of deprivation. A compelling argument exists for including self care as part of an integrated health system and allowing people who can manage their health to do so. Health system resources can then be focused on people who most need help—and who health systems are still failing. Contributors and sources: MR, MN and PA conceived the study. MR, LV and FG reviewed the literature. MR drafted the manuscript. All authors revised the manuscript. MR is study guarantor. This article is part of a series proposed by the UNDP/UNFPA/Unicef/WHO/World Bank Special Programme for Human Reproduction (HRP) and commissioned by The BMJ. The BMJ retained full editorial control over external peer review, editing, and publication of these articles. Open access fees are funded by HRP.
. Women’s self care: products and practices.PATH, 2017.
. Self care interventions to advance health and well-being: a conceptual framework to inform normative guidance. BMJ2019;365:l688. doi:10.1136/bmj.l688.
. Health care platform interventions. mental, neurological, and substance use disorders: disease control priorities.Vol 4, 3rd ed. The International Bank for Reconstruction and Development/The World Bank, 2016.
. World health report: health systems financing: The path to universal coverage. WHO, 2010.
. Incentivizing safer sexual behavior: evidence from a lottery experiment on HIV prevention. Am Econ J Appl Econ2018;10:287-314doi:10.1257/app.20160469. Self care: better daily health for individuals and societies. A global policy blueprint. Bayer, 2018.
. On the concept of health capital and the demand for health. J Polit Econ1972;80:223-55doi:10.1086/259880.